The highlight of the British domestic swimming calendar is almost upon us, as amateurs and pro athletes alike will soon be descending upon the storied Tollcross International Swim Centre to compete for critical roster spots that set-up the remaining journey to Tokyo 2020. 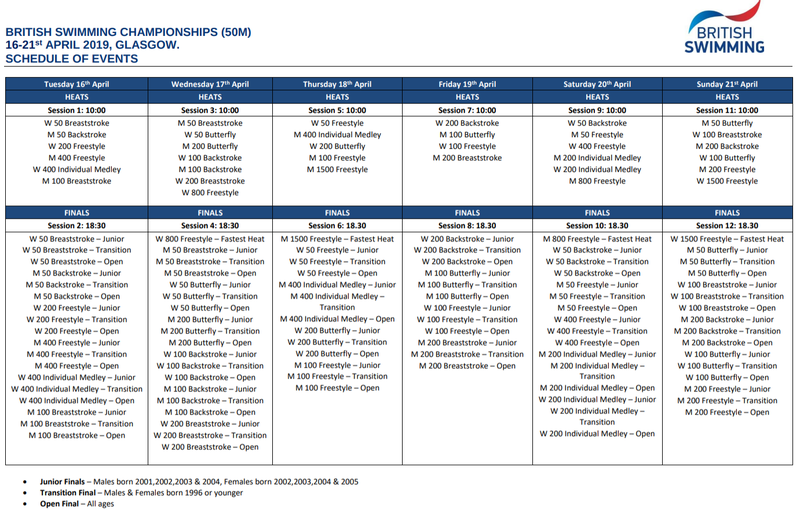 As in years past, there will be not just Open Finals in Glasgow, but also a Transition Final and Junior Final. The fastest 8 competitors from the heats irrespective of age will be placed in the Open Final, while the next fastest 8 age-eligible competitions will be relegated to the other 2 finals, with priority given to the Transition Final. The Transition Final will house athletes born 1996 or later, while the Junior Final will host the European and World Junior age groups. I’ve included the British Swimming Selection Policies for the World Championships, World Junior Championships, European Junior Championships and European Youth Olympic Festival, all linked above. 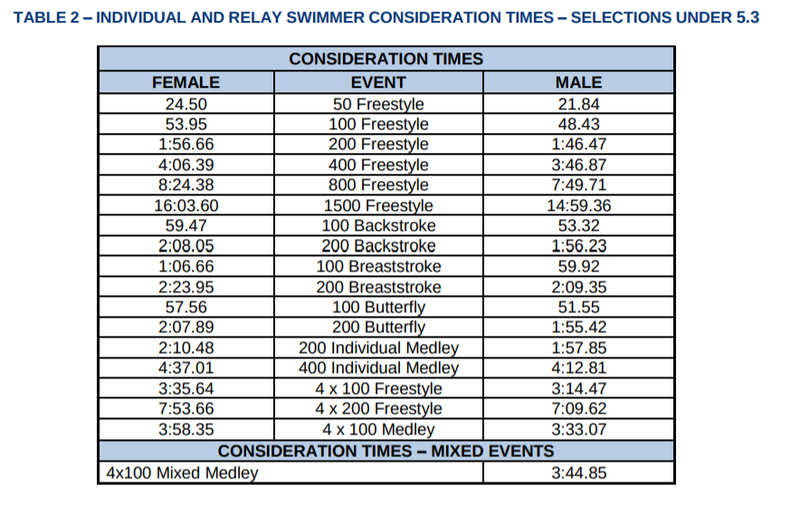 Specifically for the World Championships, as in years past, British Swimming has designed a two-table selection time strategy, with the time tables displayed below. 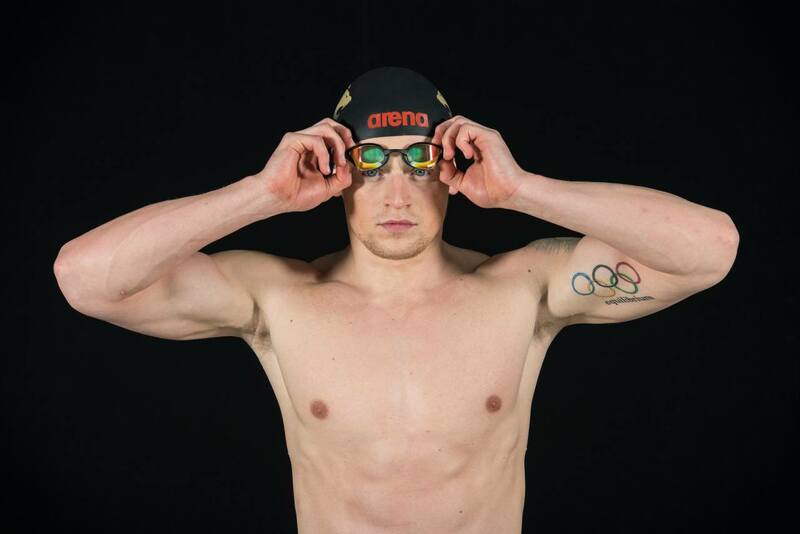 The first place finisher in the open final of each individual Olympic event at these championships will be selected for Gwangju, provided the athlete records a time equal to or better than the Table 1 QT. Following the selection of the athletes according to the aforementioned step, up to a maximum of 8 additional selections will be made at the discretion of the National Performance Director and Head Coach. After this step, consideration for selection of other athletes will then be given if such athletes better or equal times listed in Table 2 below. In an even more detailed process, athletes’ times from their performance in the final will be ranked on the percentage inside the Table 2 time. As such, there is no guarantee that swimming inside a Table 2 time will earn selection. Look for an additional meet preview highlighting specific athletes’ schedules. Oosh, that will be about 10 outright qualifiers then! They can qualify through other meets as well. Wilby??? Think Dean will qualify too (200IM). I think Dean looks really good. Not sure he will automatically qualify though. Really I don’t see many auto qualifiers but I’d be happy to be surprised. You might be right about Wilby, although i dont see any british men swimming sub 2:08. The standard in mens 200 breast seems soft compared to the other times. Most other times would be enough to challenge for a medal while 2:08 is probably 1 second away from a medal-challenging time. As for Dean – I meant he’ll hit the consideration time and qualify that way. That said, 1.56.8 wouldnt surprise me. Heard really good things about him, and the way he sat off Litchfield and stung him with a 27.0 final 50 at BUCS left a mark on me – He had so much in the tank. Likes a taper too, usually comes on a ton. Honestly, we could end up with not a single auto qualifier on the womens side. 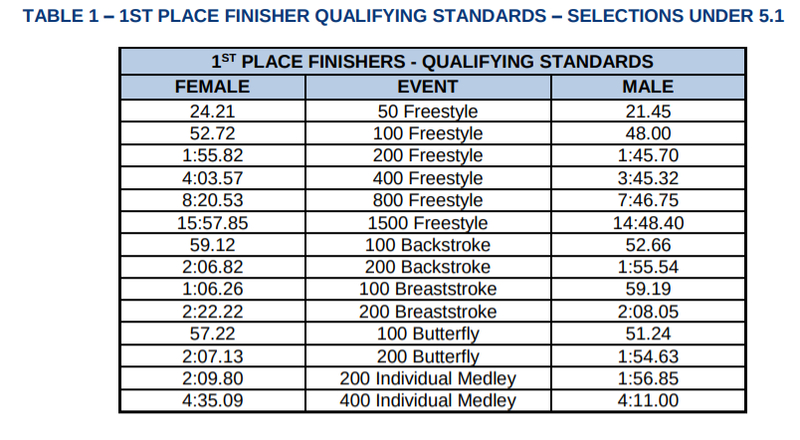 Presumably the relay times will take a 0.5 takeover per swimmer into consideration? I think Davies, Thomas, Clarke, O Connor could qualify for worlds. If Anna Hopkin carries across her scy form she may make it as well. What about Hibbott and Miley? I wonder if the athletes are tapered seeing how quick the qualification times are! Looks like it will have to be a full taper for most people to make then another full taper for worlds itself! Full-taper for all bar Peaty is what I expect. Not until the last day – I think it’s the very last event of the meet. Could be some tired legs in that 200.